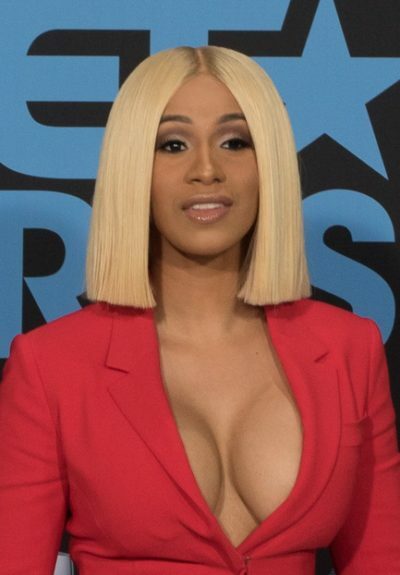 Cardi B is an American rapper, songwriter, and media personality. She was born in the Bronx, to a father from the Dominican Republic and a Trinidadian mother. Her parents both have African ancestry. She stated on Breakfast Club Power 105.1 FM that she is a Boston Red Sox fan because “That’s where all the Dominicans are at,” that most Dominican players are with the Red Sox. Her sister is social media star and television personality Hennessy Carolina. Cardi B is married to hip hop recording artist Offset, with whom she has a daughter. One thing that always bothers me is that people know so little about my culture. We are Caribbean people. And a lot of people be attacking me because they feel like I don’t be saying that I’m black… Some people want to decide if you’re black or not, depending on your skin complexion, because they don’t understand Caribbean people or our culture. I don’t got to tell you that I’m black. I expect you to know it… I expect people to understand that just because we’re not African American, we are still black. It’s still in our culture. Just like everybody else, we came over here the same f**king way. I hate when people try to take my roots from me. Yes Carribean culture represent. I love my black Carribeans, just like me. Go Cardi B. Black and proud. Cardi B: One thing that always bothers me is that people know so little about my culture. We are Caribbean people. And a lot of people be attacking me because they feel like I don’t be saying that I’m black. Some people want to decide if you’re black or not, depending on your skin complexion, because they don’t understand Caribbean people or our culture. I feel like people need to understand or get a passport and travel. I don’t got to tell you that I’m black. I expect you to know it. When my father taught me about Caribbean countries, he told me that these Europeans took over our lands. That’s why we all speak different languages. I expect people to understand that just because we’re not African American, we are still black. It’s still in our culture. Just like everybody else, we came over here the same f**king way. I hate when people try to take my roots from me. Because we know that there’s African roots inside of us. I really just want people to understand that the color that I have and features that I have are not from two white people f**king.